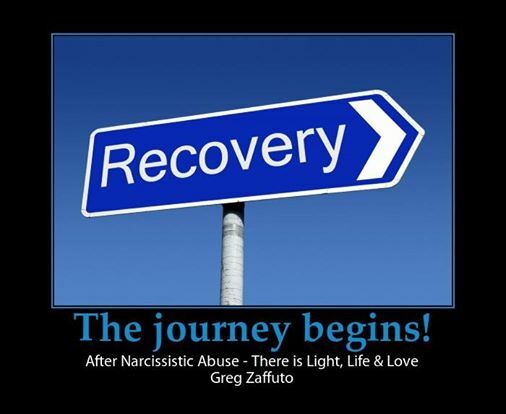 I am sharing this text from – After Narcissistic Abuse – There is Light, Life & Love. Most people live by compassion and love, so it is nearly impossible to understand a Narcissist – or the manner in which they can abuse others. Come on they wrote the “love story” for us, one in which they played the key role as the love of our life but that is all it was only a role they played. Nobody taught us that there were two types of love out there – one that was “real and normal” and its counterpart “one that was fake and intended to abuse and destroy”. The narcissist love leaves us with only psychological abuse/terrorism embedded in our minds and souls. Like a hurricane hitting our lives and everything shattered to pieces, we have to re-build that house which is our lives. Unfortunately the “love” aspect doesn’t just go away once we understand the real process of abuse – so that is like a punch to your brain from the right and left – and a conflict that seems to work against you many times and makes you fall backwards into the abuse. It is our empathy and ability to love that keeps calling out – that is what we were born with, that is what we grew up with all around us – that is real life and it plays a major role in the recovery process. There is even a great love story written called the “Beauty and the Beast” – but it even ends up with the terrible “beast” becoming an amazing product of love. The “beast” in our love story was a real life predator and we were only prey and somehow we loved this predator – a hard pill to swallow. ALSO a huge factor to consider, the Narcissist isn’t going to allow closure they are more than often off and consuming the life of another target and they have laid out the groundwork for our final demise with a smear campaign that not only makes us out to be mentally ill but THEIR abuser. They have a network of minions that they have charmed into believing their lies so they can continue to find more victims, extort them, abuse them and so on and so forth! They are predators and camouflage themselves from the real world or they can’t survive! You will go back and forth between depression and devastation for a very long time. You will have good days and bad ones. One day, you will think you can move on and the next, you wake up torn up devastated again. You don’t want to be upset and you don’t deserve to be upset because all you did was fall in love. You isolate yourself for a period of time and you surround yourself with very few people whom you are comfortable with and understand you . You have obsessive, racing thoughts and the tiniest things set you off. Your boundaries are returning (or perhaps being formed for the very first time) and you can’t believe you let yourself sink so low. You realize how much you lost and not just friends, money, life experience, etc., but also your spirit and innocence. Your kind understanding of the world has been shattered. Instead of giving people the benefit of the doubt, you suddenly have trouble trusting. You will experience constant feelings of dread and tightness in your heart. You start asking questions. Why did this happen to me and what are my vulnerabilities that enabled this? Of course these vulnerabilities aren’t your fault, but it is important to understand how you were able to be exploited. You begin to discover your strengths. Many of these were strengths you always possessed but never valued by putting them in their proper place or perspective. You realize your compassion, empathy, and love are not weaknesses. They are the most incredible gifts in the world, when applied to the right people. Your self-respect comes from within, not other people validating your insecurities and using them against you. You start to understand who you are and who you’re truly meant to be. It took the psychopath/narcissist’s nastiness to make you see exactly who you never want to be as well as awakening your amazing qualities. You begin to explore your creative side, and you stop caring what others think of you. Old friendships may change as you change and become more confident. Embrace the new you, and open your heart to love again. You are free now. You should be so, incredibly proud of yourself. You made it, and your life path has forever changed for the better. Narcissistic personality disorder (NPD) is a personality disorder in which a person is excessively preoccupied with personal adequacy,power, prestige and vanity, mentally unable to see the destructive damage they are causing to themselves and to others in the process. It is estimated that this condition affects one percent of the population. First formulated in 1968, NPD was historically called megalomania, and is a form of severe egocentrism. Narcissistic individuals use various strategies to protect the self at the expense of others. They tend to devalue, derogate and blame others, and they respond to threatening feedback with anger and hostility. That happened to me to. Funny how this just showed up on my Facebook wall out of nowhere. I guess I’m ready to believe what you wrote. Hi David, Thanks for your comment, unfortunately it happens and as I have discovered more than you would think. Wishing you all the best. Have lived all my life with it. Still suffering at hands of this person. It is soul destroying and they have no idea of the untold damage it does. It has destroyed the happiness of my family now and sometimes I just want to die. I cant or wont forgive this cruel person that robbed us of our childhood and adult yrs. such a crazy man. I dont feel so alone. Very difficult to move on, after this type of abuse. It’s ironic that this popped up on my Facebook page right now as my cousin is going through a nasty break up at the moment and after reading this i realised that he has all the traits of a narcissistic. The entire break down of the relationship was his fault yet he refuses to take responsibility for any of it. Blames her for everything. He hacked her Facebook page and sent vile messages to men who he thinks shes been seeing because they might have liked a status,pretending to be her, to turn them against her. He is telling his family lies about her and the worst was the other night he broke into the home and beat her up in front of their 6 year old daughter. She won’t go down the legal route because she doesn’t want to do that to him because of her daughter. We think she needs to get a restraining order taken out and call the police if he comes to the house but we can’t get through to her. We’re worried that he’s going to kill her one day.